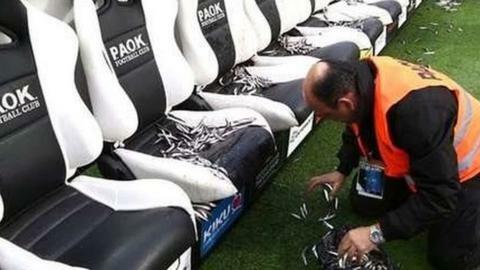 Police in Thessaloniki have arrested a PAOK fan accused of dumping a crate of fish on the visiting Olympiakos bench. A 34-year-old man covered the bench in several kilograms of anchovies in a stunt that delayed a tense Greek Cup semi-final for more than an hour. Olympiakos's home ground is in the port of Piraeus, and the club's supporters are nicknamed 'anchovies'. PAOK won 1-0 on Wednesday but the game was repeatedly halted by brawls on the pitch and three players were sent off.